I’ve heard so many of my friends say that they don’t like seeing people they know at the gym. Why? Because they’re worried about how they look. It’s easy to dismiss that by saying, ‘no one looks good at the gym’ or ‘you shouldn’t worry about what people think’ (believe me, I’ve heard that more times than I can count), but when we care so much about our appearances outside of the gym, it can be hard to break away from doing the same inside. So how can we change how we feel? I’ve often felt that if I like what I’m wearing, then it’ll help me feel more confident when I’m working out. Dark, block colours help me combat the terrible gym lighting and deceptive mirrors, whilst a looser fit stops the fabric clinging to all the bits I’m insecure about. 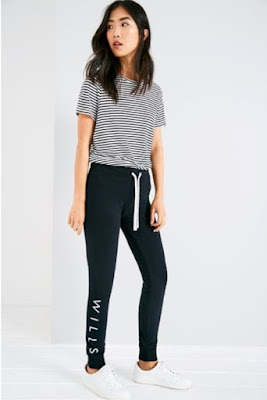 These simplistic womens joggers from Jack Wills fit the bill – and they’re nice enough to wear on a casual day out (I wear mine with a leather jacket, t-shirt and white trainers). In terms of outerwear, hoodies are ideal. They’re super warm and cosy, and a great alternative to sheeny polyester jackets as (again) they don’t cling. I look for ones which are lightweight, so that I don’t feel too bulky, and I try not to fill up the front pocket with lots of stuff. First of all, a good quality and well-fitted sports bra is essential, as exercising without the right support can lead to drooping and sagging (and, let’s face it, none of us want that). I like racer-back sports bras as the straps line up with my vests. Secondly, choose underpants that are comfortable and breathable; although thongs may help you avoid VPL, they can lead to chafing and even UTIs. Try wearing seamless underwear if you’re worried about this. Wearing makeup: good or bad? Beauty YouTuber Lauren Curtis made a video about wearing makeup at the gym, and got a lot of stick for it. However, I think it’s something that should be addressed, as there are a lot of us who just don’t feel confident leaving the house without makeup on. If you must wear makeup at the gym, make it breathable – as the last thing you want is the makeup clogging your pores and making your skin worse. Opt for a good primer like this one from SportFX, stick to a very light BB cream or tinted moisturiser, and go easy on the eye makeup (I’ll usually just apply a waterproof mascara). But what do I do with my hair?! I’ve got super long hair and I often find it really hard to know what to do with it when I’m exercising. Buns tend to fall out, and tying it up in a ponytail is not a great solution, as doing this regularly can cause traction alopecia. Instead, I opt for braids, which look pretty whilst at the same time keeping my hair out of my face. A single French braid down the back of the head looks gorgeous, but I usually need someone else to do this for me! By myself, I’m able to create two either side of my parting. You know that saying, ‘strength in numbers’? I think it works when you’re exercising too. I always feel more self-conscious when I’m working out by myself than I do when I’m with someone. If you can, find a workout buddy who motivates and inspires you – and who doesn’t care what you look like when you’re red and sweaty! Not only will you be able to pump each other up, but you’ll also be distracted with your epic partner workouts so that you can worry less about what you look like.